This lair is a seasonal home for a small group of goblinoid raiders that have been terrorizing the local region. If hunted by the PCs and tracked here, they retreat into the inside of this ancient complex (located 3-5 miles from the nearest trade route and community of any size). 5E Mini-Dungeons are single short adventures for 5th Edition which are setting agnostic and are easily inserted anywhere in your campaign. 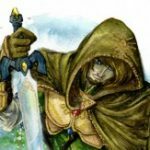 I ran a group that was brand new to Fantasy Grounds and somewhat new to 5E in general, through this last night. There are spoilers here to players stop reading after my “Summary” comments. Summary: This is a great one-shot adventure. With a group new to Fantasy Grounds and generating characters a few days before the session, we ran through it in 4 hrs. I really would like a player map for this! If I had more time I could have modified it myself in gimp or something, but I didn’t. Unfortunately there are large “S’s” that show secret doors and large lock icons on doors that are locked. My players essentially found the secrets by default and probably wouldn’t have if they weren’t prominently displayed on the mpa. A word of warning. There are a number of traps for a level one adventure! If we hadn’t found the secret areas it wouldn’t have been so much. I ended up bypassing the trapped hallway just to keep the action flowing. There are three encounters in this which was perfect for our group. I added a goblin to the final encounter with Gorg and probably could have added another as it felt a little underpowered. My group did have 5 players. There is an alarm trap in a room before the final room. It was unclear to me who this really alerted as all of the monsters were dead at that point. I probably could have added something to the final room. In the final room, as a DM you need to determine what the skull says that rises from the pedestal. Make sure you think about it in advance. Given there are some dwarven statues in the room, I had it say something that foreshadowed Princes of the Apocalypse. Most of my comments above are nits and preferences. I love the AAW adventures and look forward to playing this again with another group and trying some of the other mini-dungeons.